A Girl and Her eBooks: Wantin by Truth Devour - $0.99 Goodie! Wantin just won at the LA Book festival romance category. To celebrate the e-book has been reduced to .99 cents. 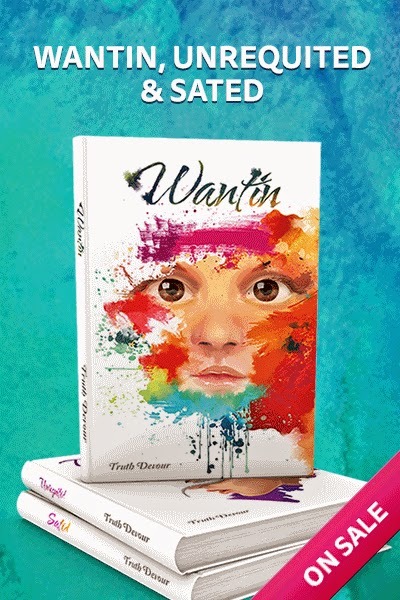 Wantin is the first book in the adult contemporary romantic trilogy by Truth Devour. The series is a chronicle written in the first person of a young girls journey into womanhood. Wantin, has been compared by reviewers of all ages to be layered with associations to novels such as Eat Prey Love due to the wonderful global adventures, and novels such as the French classic Emmanuelle and Anaïs Nin’s short story collection Delta of Venus, due to the sexual exploration and expression of the main character Talia Jacobs. Fate is relentless in its pursuit of Talia Jacobs. Presented with unimaginable turns of chance, she is drawn into the depths of tragic losses then catapulted to the extraordinary heights of life's joy. Take the journey with Talia as she undergoes her sexual, social and physical metamorphosis from a vulnerable girl into a mature young seductress. Nothing in life is ever as it seems. Is she blessed or cursed? Will she ever find the man who will love her like no other, fearlessly caressing the deepest part of her being while intertwining his soul to hers in a dance that holds the unspoken promise of forever?